IEDs proved to be a persistent and deadly threat during Operation Iraqi Freedom. They’re pretty easy to make with cheap, off-the-shelf electronics and existing warstocks, and are pretty easy to scale to deal with whatever armored vehicle you fancy. What is a modern high-tech army to do? When you consider that IEDs tend to be remote-detonated, an obvious answer is to jam them. Enter the VLQ-12 CREW Duke. 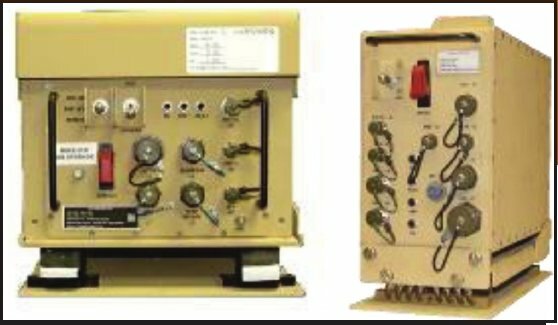 The VLQ-12 Counter RCIED Electronic Warfare (CREW) system, was designed to meet the threat of radio command detonated roadside bombs in Iraq. It is designed to be mounted to a wide variety of vehicles from the simple HMMWV to the mighty Abrams tank. Originally, CREW systems were placed in bustle racks of armored vehicles. CREW V3 is integrated into the Bradley M2A4 and Abrams SEPv3 upgrade packages in an under-armor installation. Clearly, cargo and utility vehicles have plenty of space available for the system. CREW Duke V3 comes with two major components, plus a controller, antennas, and related cabling. The primary unit weighs 70 lbs and measures 12.8″ x 12.8″ x 16.1″. The secondary unit weighs about 40 lbs and measures 14.4″ x 7.0″ x 11.7″. The secondary unit is one of the added components separating the Duke V3 from the Duke V2. The secondary unit also requires a directional antenna, the PRC-119. The PRC-119 weighs 5 lbs. and measures 23″ x 10.5″ x 1.5″. One other useful capability is threat event logging. CREW Duke can store information on the kinds of signals it encountered and jammed, which can be accessed via ruggedized laptop or PDA. This entry was posted in All and tagged militariana on June 26, 2018 by parvusimperator. 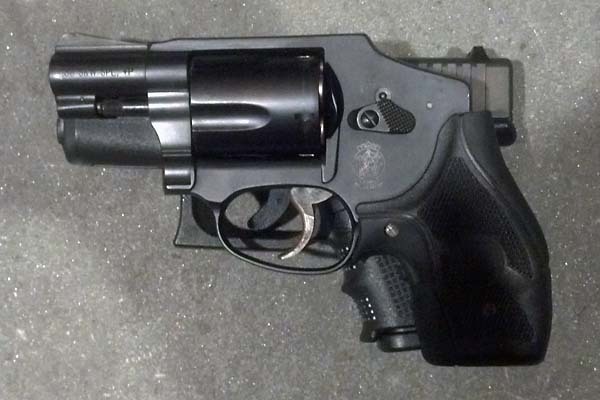 The persistent popularity of small snubnosed revolvers, typified by the J-Frame models of Smith & Wesson, for concealed carry purposes astonishes me. Back in the day, sure. Small, reliable, semiautomatic pistols in a reasonable defensive caliber did not exist. But this is Anno Domini 2018. It is not 1958. There are plenty of options if you want something really small and concealable and reliable and chambered in a reasonable defensive caliber. Off the top of my head, there’s the S&W M&P Shield, the Glock 43, and the Walther PPS, all with established track records and manufacturers with good QC. These are reliable choices. They’ve been on the market for years. They work. Really. And they provide so many advantages over the small revolver that I still am astonished that people go for the revolvers instead. And no, I also don’t know why my tactical friends keep seeking out training on the damn things. Let’s review the many ways that the small, single-stack semiautomatic is flat-out better than the old-school revolver competition. I tend to get picky about my sights. Modern semiautomatic pistols allow me to be picky. There are a wide variety of sights available for your Glock 19, letting you pick exactly the ones that work with your eyesight. Single-stack subcompacts like the PPS, Shield, and Glock 43 are no different. They all have sight dovetails. This highly advanced technology allows you to change out the sights to something that better suits your needs and eyes. It’s amazing. And these small pistols from established manufacturers have a large aftermarket. You need dovetails, but you also need sights to put in them. But we have you covered with the choices above, whether you like 3-dots or tritium or fiber optics. The vast majority of J-frames have atrocious “sights” that consist of a little lump of metal on the front of the barrel and a little trough cut in the rear of the frame. Not adjustable, not high-visibility, not tritium, and certainly not interchangeable. Simply put, the stock sights are awful and you are stuck with them. There are a few J-Frame models that actually have dovetails, but they are tremendously expensive and there are few manufacturers working with this market niche. Otherwise, better hope your chosen rounds shoot someplace sensible based on a reasonable sight picture. I’ve gotten less picky about my trigger choice these days, though I still like good ones. Anyway, I can think of few things worse in a trigger than the average double action pull of a recently-made revolver. Long and heavy, and probably gritty too. Lots of people will advocate an Apex spring kit in your J-frame. Which helps. Or you could get one of those single-stack subcompacts that has better trigger out of the box. And these single stacks can also take trigger improvements, just like their bigger brethren. I’m sure if I grew up firing revolvers and figuring out how to make that trigger work well, a slightly-lightened wheelgun trigger would be the “bees knees”. But I didn’t, so it’s not. Comparing stock to stock or modified to modified, the semiautos will have the better triggers, and you’ll likely be more familiar with them, because most of your shooting is going to be with some full size semiautomatic pistol. You get five shots in a j-frame. Six in some competitors. At which point you’re working with speed strips, probably. Maybe speedloaders, but those are bulky. This is a different and slower reload drill than the modern semiautomatic, which you probably spend most of your time shooting. And even the small single-stack pistols mentioned previously all hold more bullets. Also note that the J-Frame’s footprint matches that of the double-stack Glock 26, which holds twice as many bullets and can accept magazines from other, larger Glock pistols. Just about everybody is going to be better suited to buying a small semiautomatic these days. And you’re not giving anything up on size either. Here’s an overlay from the late Todd Green, who is also firmly in the more bullets camp, where we can see that a J-frame and a Glock 26 are both about the same size. Oh, and one more thing. J-frames with the locking hole in the side of the frame above the cylinder release have been known to have this lock break, jamming up the gun. Just what you want. This entry was posted in All and tagged firearms, modern pistols, rants on June 19, 2018 by parvusimperator. These lists, unlike the earlier Carry Optics list, are shorter and simpler. There are no optics to mount or, indeed, new sights to buy; nor is there compatibility with pre-existing tuning to worry about. So, I decided to write up all of my options, to lengthen the article a bit. We’ll call it $200 for the two items below, to cover shipping and other expenses. No competitive revolver shooters use speedloaders; they’re an extra step and not worth the time. Moon-clipped revolvers are faster, and moon clips are cheaper than speedloaders. So much the better. Moon clip holders which can carry eight clips can be found for about $150 from a number of retailers. Even with my expressed preference for six-guns, I don’t think I’d need more than 8. My usual preference is to have about 60 rounds on my belt for a 32-round stage. 48 in the holders and 6 in my pocket is close enough. Ruger recently released a GP100 Match Champion in 10mm/.40, which fits my desire to use existing stocks of competition ammo. There aren’t a lot of gunsmiths who work on Rugers, but some polishing compound and some spring work should serve to get the trigger pull down to acceptable levels. Ruger also has an 8-round Redhawk model in .357 which accepts moon clips. (They are, however, expensive moon clips.) This would let me play with the big boys in USPSA Revolver, and eliminates one of my objections to eight-round revolvers. 9mm is a wimpy semi-automatic caliber, not suited for a manly gun like a revolver, and 8-round 9mm revolvers are an abomination unto God. .357 (and yes, also wimpy .38 like I’d actually be shooting) are true revolver calibers. It eliminates another one of my objections, too; a Ruger in .38 Special is undoubtedly hipster in the modern revolver competition world. I’d be able to shoot Limited in ICORE, if Western PA ever ends up with a club which runs ICORE matches. Of course, there are some downsides. If there are few gunsmiths who work on Match Champion revolvers, there are fewer gunsmiths who work on Redhawks. The sights might not be very much good for competition, although they are at least replaceable. All in all, a compelling option: the Redhawk gets me to the 95% competitive bracket really easily, with no esoteric stage-planning requirements. Given that these are the cheap options and not especially long-barreled, a Kydex competition holster is probably the way to go. $100 is a bit of an overestimate here, but $800 is a bit of an underestimate for the guns, so it’s a wash. Some quick Googling suggests that a Kydex holster for the Redhawk might be hard to come by. In that case, I would have to go leather, which is delightfully old-fashioned. A what? Yes, Italian pizza-gun manufacturer Chiappa, who you might know better for their replica old-time firearms in the finest spaghetti western tradition, also makes a six-gun which wouldn’t look out of place on the set of Blade Runner. The bottom cylinder fires rather than the top one, and so the barrel is mounted low in the frame. The recoil impulse is nearly straight back. People say it’s nice. The Rhino can be had in .40 with a range of barrel lengths; I’d probably want the 6″ barrel because, in my opinion, it’s the coolest-looking1. On that note, as I intimated in the first post in this series, the Chiappa’s major advantage is that it’s cool, and beyond that, that it’s uber-hipster. Nobody shoots Major in USPSA Revolver; of those who do, nobody shoots .40; of those who do, absolutely nobody shoots a Chiappa Rhino. That does have value to me; I like the attention I get when I’m shooting something offbeat. Unfortunately, nobody makes holsters for Rhinos either, and a six-inch barrel makes for an unwieldy draw. I’d have to look into a Guga Ribas holster, sufficiently adjustable to grip the trigger guard of just about anything. That adds some expense. I could also go the boring way, buying what everyone else has, a 9mm S&W Model 929. Not only is it the most expensive option, it’s also the most popular one, and if you know me at all, you know how very unlikely that is. If I were going to take leave of my senses and buy the boring race gun everyone shoots, I could hardly cheap out on the holster. So, I’ve laid out four options. Every revolver option costs at least $200 for a belt rack and moon clips. Both Ruger options add $900 or so to the total, for $1100 to get in the door—slightly less than the Limited P-09. If I added another $100 or $150 to the total, to bring the price up to the P-09’s all-in price, I could get an adjustable race holster. The Rhino adds another few hundred bucks of cool for about $1300. Unlike the Redhawk, it wouldn’t be competitive, but I would at least look cool while shooting slowly. The Smith and Wesson option, at $1500, is probably out of my price range, in addition to being prevalent and therefore boring. You can’t make me. Not yet, anyway. More on that in a second. The way I see it, it comes down to P-09 Carry Optics, which is cool in a modern technological way, and the Ruger Redhawk, which is cool in an old-time lawman way. What about the Rhino? For me, it comes down to competitiveness. I’m not shooting USPSA to become a better shooter, although that’s a pleasant side-effect. I’m shooting USPSA to compete in USPSA. The point of the game is the game. For the same reason I wouldn’t go to a fencing tournament with a left-handed foil, I’m not going to intentionally buy equipment which is well below par. As classic as the Ruger six-gun is, and as cool as the Rhino is, competing with them is, in a word, uncompetitive2. So what’s it going to be? A Carry Optics P-09 or an 8-round Ruger Redhawk? I said I don’t have to answer yet, and I’m sticking by that. 2018, and in all likelihood 2019, are for improving with the guns I already have. Revolver requires a whole new level of planning, and a whole new level of shooting perfection, over Limited and Production. I have a pair of plenty-competitive guns I can easily shoot two seasons with. In two seasons, the story might be different. Carry Optics rules are a moving target right now, and I don’t want to commit too early. On the flip side, in two years, Revolver might not be a USPSA division anymore, or Chiappa might come up with an 8-round Rhino. The point is, choosing now would be silly. I have time. It doesn’t matter how I lean now; it matters how the landscape looks in two years. I’ll let you know what I’m doing then. This entry was posted in All and tagged competition shooting, modern pistols, projects on June 14, 2018 by Fishbreath. While we're committed to keeping our long-form posts free for all, short ones like this are exclusive to our patrons. To read it, please consider supporting our work! This entry was posted in All and tagged competition shooting, rants on June 13, 2018 by Fishbreath. Back in the 1950s, when rocketry was extraordinarily difficult, and TV was full of videos of NASA rocket tests failing miserably, Gerald Bull had an alternative idea: Use a giant gun to put a payload in orbit. This led to Project HARP, which got a lot of great research done. By the 1960s, we had figured out (mostly) how to make rockets that work. It was still hard, but now we could generally expect launches to work. And so the plug was pulled on HARP, but Gerald Bull still dreamed of using a giant gun to put a satellite in orbit. Eventually, in the 1980s, he found someone with money willing to back his dream once more. That man was Saddam Hussein. Project Babylon came in two phases. Stage one was “Baby Babylon”, a proof of concept model with a 350mm bore and a barrel length of 46 meters. This was initially used for horizontal testing, and was then erected on the side of a mountain. The full size “Big Babylon” would have been the biggest gun ever, with a one-meter bore and a barrel length of 156 meters. The original design was intended to be suspended from a steel framework by a system of cables. Testing of the Baby Babylon cannon showed issues in dealing with seals between the barrel sections. While these were being fixed, Gerald Bull was assassinated outside of his Belgian apartment on March 22, 1990, which crippled the project. It would not be resumed after the First Gulf War. Bull’s assassination was almost certainly not due to his work on Project Babylon. The superguns were massive, fixed targets. Easy to spot with aerial or satellite reconnaissance, easy to destroy. But Bull was also working on improving the range of Saddam’s Scud missiles. Those are much more effective than a giant gun. This was the project that most likely angered Saddam’s enemies enough to get an assassination. The most likely candidates are Israel or Iran, both of whom have intelligence agencies with lots of experience in liquidating potential problems. Project Babylon itself is also extremely problematic. It’s a lousy weapon, as we’ve mentioned before. But I’m also extremely skeptical of their utility as a launch system. Even with a 156 meter barrel, the acceleration is going to be absolutely brutal. This is going to seriously restrict the payloads you can launch. A rocket is going to be far gentler on the payload, and much less likely to wreck a satellite. Plus, rockets can accept oversize shrouds to handle larger payloads, or be clustered to lift more weight. You’re pretty stuck with the weight capacity and payload diameter restriction here. This entry was posted in All and tagged history, militariana, resurrected weapons on June 7, 2018 by parvusimperator. I’ve been working hard on this project over the past week or two, and I put another week or two into it at the end of last year. Finally, though, it’s just about ready to show. Gravity, Graviton, and Pendulum are the three components of an end-to-end wireless hydrometer system for homebrewers. 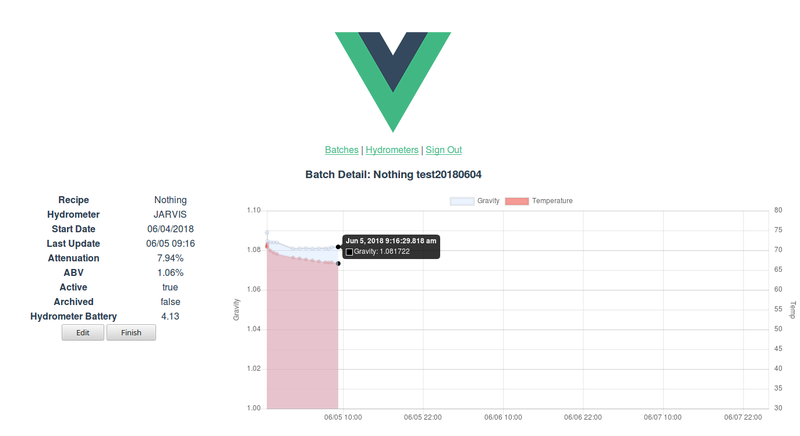 For each batch you have in progress, you get a dashboard with a chart showing measured gravity and temperature over time, along with apparent attenuation and current calculated alcohol by volume: everything you need to know about a batch of beer in progress. Obviously, I homebrew, or else I wouldn’t have started on this project at all. I homebrew with a friend, however, which means that wherever we brew, at least one of us is going to be remote. The ability to check on a beer remotely is therefore valuable to us. There are other existing systems: the open-source iSpindle, which inspired this project; Tilt, a commercial floating hydrometer of the same sort as Pendulum and iSpindle; and BrewBuddy, a commercial product which solves the long-term power issue by replacing your carboy bung and dangling a sensor-only torpedo into the wort. The commercial products are out because we homebrew in part because it’s cheaper than buying good beer, and a do-it-yourself solution is way cheaper (if you, like me, value your labor at near-zero). Why not an iSpindle, then? Because we brew in glass carboys, whose necks are a mere 29.5mm across at their narrowest points, and iSpindle uses an enclosing cylinder which won’t fit. So, because no product out there fits our needs, and because Go, vue.js, and some very light electrical engineering are all useful skills, I decided to roll my own. Like all tilt hydrometers, Pendulum uses the interrelation between density and buoyancy to figure out the density of the medium it’s floating in. A cylinder with a weight at the bottom naturally floats at an angle. If the liquid is denser, the angle between the hydrometer and the vertical increases. If it’s less dense, it decreases. Pendulum is calibrated by preparing a series of sugar-water solutions of known density, recording its measured tilts in those solutions, recording specific gravity readings from a calibrated hydrometer, and providing tilt-gravity pairs to Pendulum’s configuration interface. It does the required calculations internally. Pendulum uses an ESP8266 microcontroller, a GY521 MPU6050 accelerometer/gyroscope breakout board, and a lithium-ion 18650 battery. Which precise ESP8266 board depends on how it fits in roughly 27mm tubes; I have several coming which will help me answer that question. The board I’m using for development has some nice features, like built-in USB battery charging and discharge protection, and if possible I’d like to stick with it. As far as cylinders go, I have two options: a 27mm outside diameter jobber with a narrower screw cap, which will have to be hacksawed off, and a 27mm inside diameter tube used to hold collectible coins. The former may be too small on the inside, unless I detach the battery caddy from the development board, and the latter may be too big on the outside to fit into our carboy. 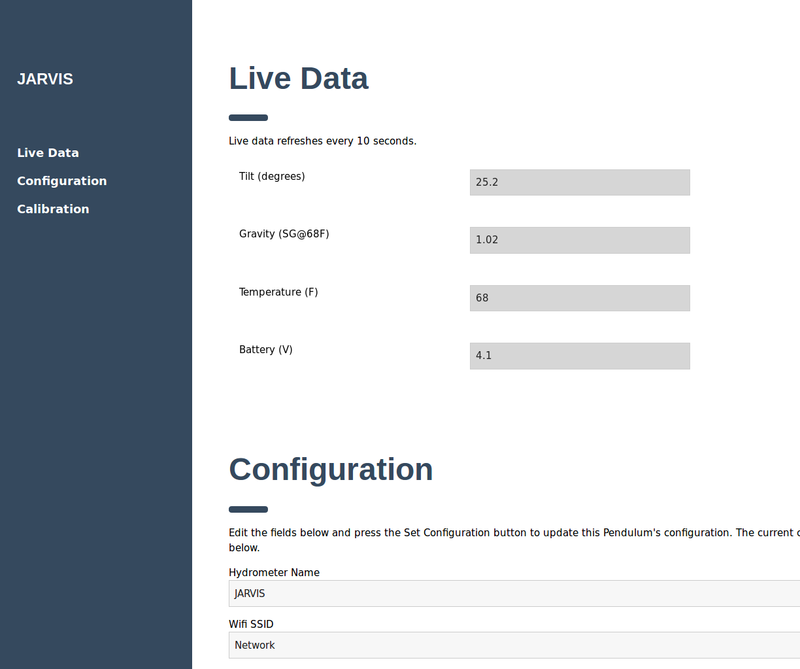 In addition to the hardware task above, I have some work to do on the software side, too; some fixes to hopefully make the ESP8266 wifi connection slightly more reliable, and some changes and improvements to the web app and back end to allow for management of users and permissions. Most of the hard work is already done. It’ll take about a month for the various enclosures to arrive from China, a week or two to work out the remaining hardware issues and perhaps add a transistor to the voltage measurement circuit, so it can be fully turned off. By mid- to late summer, I should have something release-ready, with enough documentation and photography so that anyone handy with a soldering iron should be able to assemble their own Pendulum. Until then! This entry was posted in All and tagged coding, gravity, projects on June 5, 2018 by Fishbreath.